Launch Academy instructors are also practitioners; most run well regarded web development consultancies. They have a collective 20 years of experience in Ruby On Rails Development. They will help get you unstuck so you don’t waste time. Most are active in the local development community, and some are even user group organizers. You will work on real projects. Academy’s Hiring Partners shape our curriculum with relevant topics. We’ll train you across the stack. Being exposed to the full stack makes you most valuable in the web development industry. Launch Academy holds far fewer cohorts than other boot camps thereby placing emphasis on quality of graduates vs. quantity. By choosing to hold cohorts one at a time rather than overlapping in a rolling style as others do, acceptance rates are low ensuring a high, qualitative focus on employability and developing necessary job skills to succeed well beyond Hiring Day. Launch Academy sets itself apart from other boot camp styled programs via its long-term focus on students’ successes after graduation from the program. A structured, post graduation support program in the form of in-person office hours and virtual consults ensures emotional and job-specific support during the initial phase of their new jobs. Hiring rates are important but we consider them to be vanity metrics. Instead, we judge our success on the successes of our graduates in their new positions. Post Grad Support: Launch Academy is the only boo tcamp that offers a fourth stage to the model via our Post Grad Support program. Graduates have the support of their mentors for a period of 6 months after they have signed on with one of our companies at Hiring Day. This feature ensures that students will continue their upward trend in their new careers in web development by assisting them via office hours, email, phone, etc with any programming, project related or career support they need. Hiring Companies also view this as a value add towards the recruiting fee they pay to obtain students at Hiring Day. We’ve extended the alignment of goals between the boot camp, student and hiring companies well past graduation. Rolling Hiring Day Access: Any student who graduates from Launch Academy is entitled to attend any Hiring Day held in any city by Launch Academy at any point in time for any reason. Breakable Toy / Passion Project: All students will come to Launch Academy with an idea they have always wanted to convert into a product or service. We will help students identify which of these ideas will best flourish during the 10-week period. Students will work on their projects before, after and during the regularly scheduled challenge-based curriculum with the assistance of their mentors and fellow students. Students will present their breakable toy at Hiring Day to prospective hiring companies to compliment their portfolio of work which includes their other published code on Github. 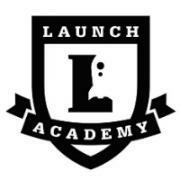 Launch Academy offers $500 scholarships to females, veterans and ethnic minorities.